As you may know, I am doing the Layer Cake Quilt Along at Moose on the Porch Quilts. As I designed the first block, I didn't do it the week my design appeared. The original block was not in the fabrics that I am using for the quilt along, so I decided to make it again in the proper fabrics. Now I have a block that will blend well with the other blocks in my "quilt along" quilt. It is not perfect but it is just fine with me. The center is also fussy cut from the same line of fabric. Those flowers will appear in another block somewhere along the way. Quilt alongs are exciting to me. 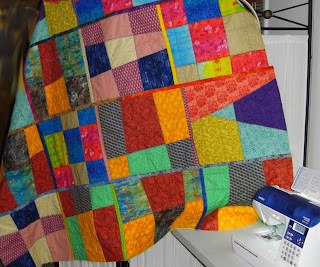 Plus, for me anyway, it is an easy way to make a quilt without pressure to "get it done." The last quilt along was over before I was ready for it to be over. How do you feel about quilt alongs? Does not knowing what the various blocks will look like affect your feelings about it? I got a new penny whistle set from Ellis Whistles, UK It is a great instrument. I am learning the differences in it and my Burke whistle. (This is similar to switching to a different sewing machine - even though they do the same things you have to work a little differently) So there are a few mistakes. Oops..sorry. They aren't bothering me too much, I hope they don't bother you. As for the ball cap, I had to hide my unkempt hair. Ha ha.. it is a lazy morning, what can I say? Then I did one of my "on the fly" compositions. That is, I make it up as I go. Hence, I sometimes make little mistakes on these also. In the United States, today is Thanksgiving. I am thankful for many things. So I decided to pick ONE and share it. I hope this "Happy Tune" makes you smile. This video has also been added to my Videos-Entertainment page. Okay, I am going to add a second thing I am thankful for - my friends and readers who put up with my playing and never complain, but often say nice things. I love you guys and gals! I got an email yesterday that had a great surprise for me. I had entered a giveaway at Quilting Arts on Pokey Bolton's blog. The prize I will be getting is a "fat stash of fabric from Riley Blake." I love the bright happy prints by Riley Blake. Yaay. Since my comment had mentioned my penny whistle (and that was what got Pokey's attention!) I sent a link to my video with my mailing info. I now have a comment on my YouTube video from Pokey Bolton - Yippeee!!!! I love nice comments. I would put a picture from the YouTube site, but you can just click on the link. We love this! Thanks for sharing this video with us Quilting﻿ Arts editors! But I discovered that the author of the book I learned to do this from has a video of the basics on youtube. So here is your demo - direct from the source. I thought I would let you in on this in case you want to do your Black Friday Shopping. You can start on Wednesday. How cool is that? AccuQuilt’s Black Friday Sale – Lowest Prices Ever! AccuQuilt is giving its blogger friends a sneak peek of their upcoming Black Friday sale! As you all know, Black Friday has become a great shopping tradition among Americans everywhere. However, a majority of consumers now prefer to shop online to escape the dangers of stampede and the hassles of long lines at stores. If you can’t find the items you want, it’s easy to hop from one store website to the next without being disappointed. Savvy online shoppers know how to get the most out of Black Friday sales by utilizing blogs, Facebook, Twitter, and other websites to get the inside track on tremendous sales. AccuQuilt is offering the lowest prices ever on some of their most popular items plus special Daily Deals you don’t want to miss! AccuQuilt’s Black Friday sale begins on Wednesday, November 24th and ends on Cyber Monday, November 29th! Don’t miss out – visit accuquilt.com starting Wednesday to place your order! Now tell me, what is on your list to find a deal on for Black Friday? Do you go out and shop in the madness or stay home and look for the cyber deals. I am very much a stay home/cyber deal kind of guy. Meanwhile, the actual reason for this post is to share some of the other photos from the sale. Our minister's wife, Rita, is a lovely and talented lady. She sings, plays guitar and does fiber art. Yes, she is a weaver. Her works have been juried into some very nice shows. Here are some pictures of her work. This last picture is a close up of the weaving. I adore her work, but it is all women's apparel so I am out of luck. You may notice that Rita is not in these pictures. There is a reason for that. You see, Rita had another commitment on Saturday so she got a helper to run the booth for her. Another vendor, who was next to me, is a fantastic nature photographer, Dave Burks. Dave has a natural eye for composition. He is also a close friend so it was great to have his booth next to mine. Dave prefers to be behind the camera so he isn't in his booth either. Be sure to visit Dave's site and see his great work. And of course no church sale would be complete without FOOD! The church ladies had lovely baked goods that they were still putting on the table as I was taking pictures. Mmmm.. and canned goods are nice too. I think these are some type of pickle. There was something for everyone. And to round things off, let's have a couple more of the outdoor pictures. A close up of the Japanese maple that I showed you in the last post. That glorious texture would make a great fabric print. Ah, another show/sale ends. I am happy. I got up waaaaay early for me (4 am) and started on this today. Luckily I have been making things for weeks/months for this sale. I did well! I sold all but two potholders, all but three packages of notecards and some of everything else. I even sold a quilt. Here is a picture of my booth before the sale opened. The picture on the wall is NOT my painting. It is there all the time. I hung the bright puzzle quilt in the window behind me to ward off some of the heat from the sun. (it got surprisingly hot!) Then on my PVC pipe display rack I hung four other quilts. The sampler quilt on the left is the one that sold. I made that quilt from the Jelly Roll Quilt Along blocks. The purchaser wants first dibs on the one I am making now in the Layer Cake Quilt along. Isn't that great? I also have my A-frame display rack on the right loaded with covered notebooks, photo albums, table runners and coasters. Just under those are my potholders. My jewelry display is in the center of the table and my notecards are along the front left two thirds of the table. There are paintings in the window behind the table. Yes, ma'am/sir, I really did make all of this myself. <----- I said that numerous times. I also got lots of nice compliments. I think my head may have swelled a bit. I took pictures of some other booths also. But I will save those for another day. It was beautiful outside. I went out into the courtyard and took some pictures. I will tease you with a couple of them. Japanese Maple near the outdoor altar. Another red tree and the fountain. I love those gabled windows. I just entered a wonderful giveaway. The title of this post is how I am feeling about telling you all about it. I truly want to win this one. Okay, I love you all so much, I Have a Notion to tell you. But maybe I won't and you can figure it out for yourselves. Quilt Along and Mail Call! Today was busy at work. I had lots to do for a good part of the day. I love it when the work day goes by and doesn't drag. I did peek and see that the block had been posted for the Moose on the Porch Quilts Layer Cake Quilt Along (that is a mouth full) had been posted. So making it was on my agenda when I got home. I also got a NICE package in the mail. Melissa, at Ardeas's Nest had told me that she was sending me a little thank you. She said she was "working on it" so I was thinking "cool something she is making!" Meanwhile, another friend, named Barb, has been teasing me about a present she knows I will be getting in the mail soon. She told me that it wasn't from her though. She also said that I would know when I got it and to let her know. I love surprises, but man, I was going crazy wondering about it. okay...someone was lucky because I can't remember telling either of them how I adore dolphins, but I do. These two are made to go together. Mmmmm. Hibiscus! Now isn't this a vibrant red? I love the flowers in a border like effect. And more hibiscus in a blue-green and a burgundy toned red. 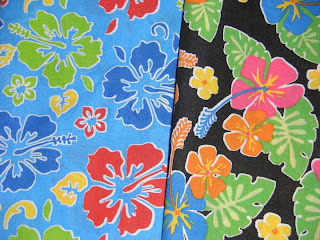 You know, I am thinking maybe I can add the dolphins in and make a "Flowering Island Delights" quilt. How old are you? How old am I? Does age matter much? "I am still every age that I have been. Because I was once a child, I am always a child. Because I was once a searching adolescent, given to moods and ecstasies, these are still part of me, and always will be... This does not mean that I ought to be trapped or enclosed in any of these ages...the delayed adolescent, the childish adult, but that they are in me to be drawn on; to forget is a form of suicide... Far too many people misunderstand what *putting away childish things* means, and think that forgetting what it is like to think and feel and touch and smell and taste and see and hear like a three-year-old or a thirteen-year-old or a twenty-three-year-old means being grownup. When I'm with these people I, like the kids, feel that if this is what it means to be a grown-up, then I don't ever want to be one. Instead of which, if I can retain a child's awareness and joy, and *be* fifty-one, then I will really learn what it means to be grownup." So some days I am a teenager, some days I an an "adult" - but mostly I am ageless too. I frequently shock younger people when I tell them my age. The number one response: "I thought you were my age" I am, I have been that age! One of my co-workers is also an artist with wood carving. He carves these delightful old world Santa's from cypress knees. He has just opened his 2010 online Gallery. He just had his BIG show of the year at Christmas Village in Birmingham. While he was there he met a lady who is also a blogger. She doesn't make quilts (that I know of) but she does blog about FOOD! Glorious FOOD. Food that is delicious and easy to make. Did you hear me? Easy to make!!!! Yeah, I have started following her blog called "Plain Chicken" Now I have a strange confession to make. I love to eat. BUT I don't eat chicken. No, really, I don't. And yes, I really am from Alabama. But I still don't eat chicken. However, even though her blog is "Plain Chicken" the food is NOT plain chicken. Thank Goodness. I will be spending days reading through it and collecting recipes. First on my list to try is "Black Bean Brownies" - I admit that sounds slightly gross, but I will try most things. And hey, chocolate is involved here! LOL. Have a great day and go find a recipe you want to try and let me know how it comes out. Okay? I am very happy to enjoy all the freedoms I have. For that, I take today to thank our Veterans. Many have fought and served our country. Sometimes they didn't agree with the fight but they felt that we deserved to be free. For that I am truly thankful. In the USA, in 1919, Woodrow Wilson proclaimed November 11th as a holiday to honor our Veterans. Thank you Mr. Wilson. But more importantly: Thank YOU to all the Veterans who have kept us free. Peace be with you. Who Says Boys Can't Play with Dolls? Kelly, over at I Have a Notion, is giving away a book by Elinor Peace Bailey She asked "why do you want to win it" because she wants the winner to really use the book. I commented that I would like it because I had made one art doll but didn't know really know what I was doing. I will say that I don't think I did too shabby on it though. So I am posting pictures. I will say that I made this doll over a year ago. She normally sits on top of an easel in my living room. I took her down and posed her so that you can see her better. Notice that heart? It has a heart yo-yo topped with a heart button. Here you can see the back of her bodice. There is also another heart button on her dress - just for fun. Her dress is made from three old neckties. I quit wearing neckties a few years ago, so I am recycling them as needed. I found the basic doll body pattern somewhere online. For the rest I just sewed and played until I had something I liked. Okay, two comments asked about her name. I haven't named her - and she hasn't shared her name with me. I just call her "the goddess." It has been a few days since have showed anything I am working on. There are several reasons. The first one is that I have been a lazy blogger. The second is that I am working on a quilt that I made the top for quite a while back. So I kinda had a moment of shame, then I thought "why." Do you have tops or "flimsys" as they are called that you have made and are unquilted? If you don't - well I am not sure to applaud you for being so conscientious or to wonder if you just haven't been doing much quilting. Ha ha. Anyway, this past Saturday I squared up the top I had made in the Jelly Roll quilt along. I finished the top in August. So it has been waiting for 3 months. I decided I needed another lap quilt for the sale. I layered it and basted it with the "bent" quilters safety pins. I keep them in a plastic container and they are all open and ready to use. Here is a picture of them. You really can't see how "bent" it is in this picture, but the bend makes it easier to fasten them when you are basting AND to open them when you need them out of the way while you are quilting. See that bend? It is so much easier to baste with that curve in the pin! Tonight I finished quilting this top. (unless I decide to add more later) Right now I am planning to trim it as is and bind it. As you can see, I used a simple muslin backing and the quilting is all straight lines with the walking foot. The open areas are at most 6 inches. Since the batting states "leave up to 10 inches open" I think it is enough quilting. Unless I get a burr under my saddle and need to add more, it is quilted. There is an article in today's Houston Chronicle that Ricky Tims shared. The title is "Rock Stars of the Quilting World" I will put a link at the end of this so you can read it for yourself. In the article Katie Pasquini Masopust is mentioned as being a household name. Well, in the right crowd anyway. She joked "Not many people know it, but I'm famous. In the right crowd, people know who I am." That got me to thinking. I use SiteMeter to see if anyone is reading my blog. (Yes they are and YOU are proving it by reading this!) One cool feature is a world map of visitors. 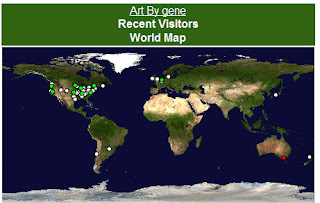 Here is a map of the last 100 visitors to my blog at the time I am writing this. Now go read the Houston Chronicle Article for yourself! And have a great day! This Rock Star loves you. Quilt Along at Moose on the Porch Quilts!